The Nomad Lounge is a new bar/lounge that is located alongside Tiffin’s in the Animal Kingdom. While it isn’t a full-service restaurant, guests needing a break and wanting to relax a little can find the ability to do so here. Here are the six things that you’ll love about the Nomad Lounge! 6. Location – Nomad Lounge is located in the thick of it all. Guests needing to fuel up for a trip to Pandora can do so at the Nomad Lounge since it sits just before the bridge taking you to Pandora. The lounge faces Pandora and sits on the shores of Discovery River, so guests can see magnificent views of the river and hear the sounds of Pandora from their seats! 5. Bar Food – guests needing some food to recover from riding a banshee can also find a good selection of bar food to enjoy at the Nomad Lounge. Guests can’t get full-size entrees here, but are able to enjoy from a variety of appetizers including a unique charcuterie platter, Waygu beef sliders, delicious oven roasted wings, and more! 4. 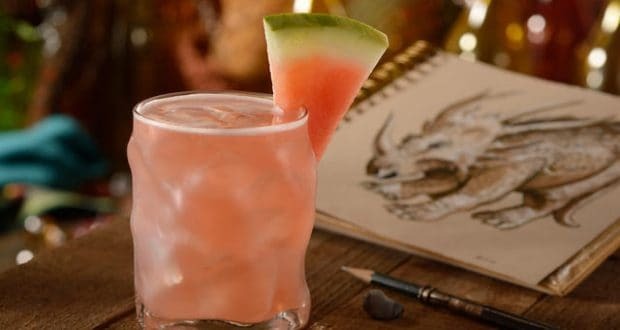 Diverse Drinks – regardless of what beverage you want, you’ll be satisfied with the drink menu at Nomad Lounge. Classic beer drinkers will be able to sample beers from all over the world. Guests who enjoy a cocktail will be able to find a variety of lusciously delicious creations, while guests wanting a refreshing glass of wine can find that, too – it is definitely a destination for guests to visit! 3. Indoor/Outdoor Seating – seating is available inside of the Nomad Lounge, as well as outside under a covered awning. Outside guests will find oversized outdoor furniture with comfortable cushions to enjoy their snack and drinks at. If the weather is too hot, guests can also find a table inside or a seat at the bar to enjoy some time out of the sun! 2. No Reservations Required – guests wanting to enjoy a drink and a snack can do so without an advanced dining reservation. We enjoy being able to fit a stop at the Nomad Lounge in without having to plan it out. It can be crowded at times, so you may have to walk around a few times to find an open table or a party finishing up and ask to take their table. 1. All Day – since Nomad Lounge can get busy, but also because it serves a great collection of food and drink, it will be open most of the day at Animal Kingdom. Nomad Lounge opens their doors shortly before lunch and remains open for the remainder of the day. We’re confident though that if you find a table, especially outdoors, that you’ll want to stay put for the rest of the day! Nomad Lounge is a great place to stop and take a break from a busy day and has something to please every person in your party — have you been to Nomad Lounge? What is your favorite part of visiting? Tyler is a lawyer living in South Florida who visits Disney World at least once a month. He enjoys re-living classic Disney experiences and discovering new things about the parks when he visits. Friends and family always ask him to plan their trip for maximum Disney magic!